This entry was posted in pistol, weapon and tagged 9x19, Cerakote, Glock, Kkote. Bookmark the permalink. Sweet mother of chrome, that’s ugly! Who ever did that needs to be taken out and beaten until they see the error of their ways. 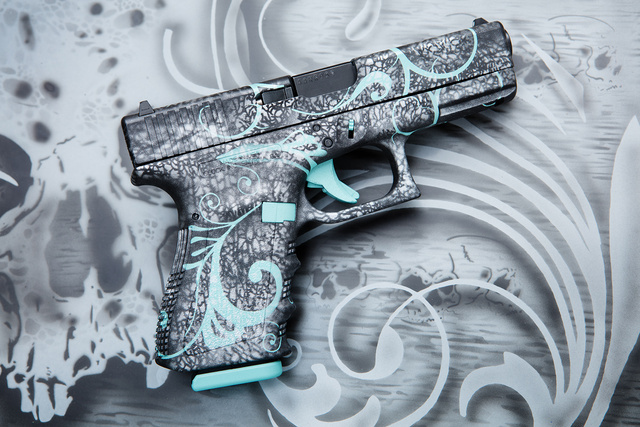 I got no issue with decorating a pistol, I’ve seen some gorgeous examples. But that thing makes my eyes bleed. That’s why it’s a custom pistol, as in “custom-er requested”. Well, it’s not for me, nor are any of the highly embelished “tribute” guns, nor the finely engraved English double guns, but I enjoy seeing them and I would be saddened if people stopped making such things. This one is very nice. Good job, who ever you are that did it! LOL! This was for a female customer who wanted something girly and attention-getting. She is THRILLED with it. Definitely not for everyone. But also definitely custom made for the person who requested it!